The holiday season is quickly approaching and with it comes cooler weather, time spent with friends and family, and homes decorated with holiday cheer. This season can be one of the most exciting times for children but can also pose new dangers. Take away the worry by following these tips supported by the American Academy of Pediatrics to make your family’s holidays safe and memorable. One of the most significant holiday fire hazards is the Christmas tree. There are several things to consider when purchasing a tree. If buying an artificial tree, make sure it is labeled as “fire resistant” and “UL approved.” For live trees, choose one based on freshness. The needles should feel soft and moist and should not be easily broken. The drier and older the tree, the greater the fire hazard. Make sure the tree is getting fresh water frequently and is placed in a stand that is sturdy. This is especially important in home with young children or pets that may be running by and bumping into the tree more frequently. Make sure to only use lights that are labeled “UL approved” which signifies that they are certified by the Underwriters Laboratories which is a nationally recognized, independent, product safety certification organization. Although most lights are now “cool burning” it is still a good idea to turn off all lights at night before going to bed or before leaving the house. Make sure to inspect all strings of lights before decorating your tree or home to ensure there are no broken bulbs or loose wires. Make sure that lights being used outdoors are labeled for outdoor use indicating they are water resistant. Burning candles should always be on a flat surface, out of the reach of children, away from trees/plants, and always monitored. 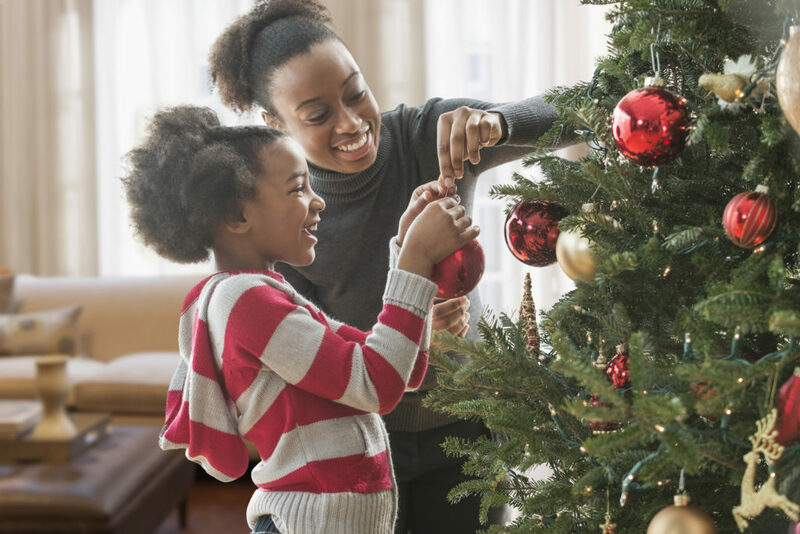 In homes with small children, make sure tree trimmings are non-toxic and make sure sharp or breakable ornaments are out of the child’s reach to avoid accidental injury or ingestion. Remember to keep potentially poisonous holiday plants out of the reach of children and pets including mistletoe and its berries, holly berries, and poinsettia flowers. The holidays are a great time to make sure every smoke detector in your home is working and with a fresh set of batteries. Make sure your tree and other trimmings are placed away from space heaters or fireplaces to avoid accidental fires. If your family will be using a gas space heater to stay warm this winter, make sure you have an operable carbon monoxide detector nearby that can alert you to the presence of this dangerous invisible gas that can lead to serious illness or death. In a season filled with gift-giving, it is important to consider the safety of the toys you are bringing into your home for your children. Every year thousands of children are unintentionally injured by toys. Make sure to read the label and buy toys appropriate for your child’s age. These age appropriate markings on toys are based on the tested safety guidelines of the toy with regards to whether there are potential choking hazards and whether the child has the developmental ability to understand how to properly play with the toy. It is also important to take recall notices on toys very seriously. The Consumer Product Safety Commission sets up regulations to ensure toys are safe and are recalled if found to have unsafe lead levels, choking, or fire hazards. Toys that are recalled should be removed from your home right away. It is also a good idea to screen toys yourself ensuring that they are well-made, do not have small parts that can come apart and pose choking risks, do not have any loose ribbons or strings that could cause strangulation, and do not contain toxic materials or ingredients. Don’t forget about your family’s mental health during the hustle and bustle of the holiday season. The holidays are full of sparkly lights, music, crowds, parties, and sweet treats, understandably leading to plenty of over-stimulation and breaking of routines. Make sure your child is getting plenty of rest to reduce the stress of this busy time of year. Make sure younger children are receiving extra supervision while your home is filled with new and enticing decorations and while holiday shopping in the crowds. And lastly, remember to slow down and enjoy this holiday season with your children. Make it a priority to set aside time to give them your undivided attention—the gift they need the most. Next month’s column will include tips to survive the dreaded cold and flu season.